Cabin Fervor: I love her. 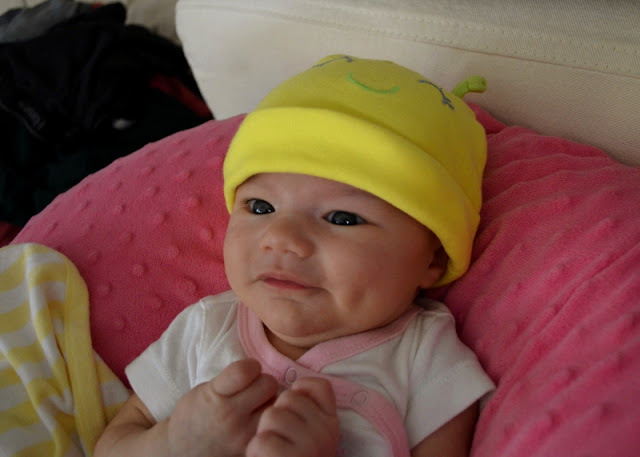 7 weeks old and learning how to use her face for smiling, smirking or whatever this expression is. I go back to work on Wednesday, and that is really killing me. Eight weeks is just not long enough for maternity leave. I've never been apart from her for more than an hour or two. I'm nervous about the logistics of life, about pumping at work and about having enough gas in the tank for my job, my baby, my husband and my house -- the classic lament of a working mother, I suppose. My main comfort about these things is that I tend to be more productive when I have more on my plate, so maybe it will be easier than I think. But that won't change the fact that I'm going to miss this girl like crazy during the day. I love my job because it has meaning; the nonprofit I work for focuses on helping the poor, the sick and the marginalized all over the world. I decided to go back to work not only to have the income, but also (and mainly) because the work my organization does is bigger than I or my family. Through my job I get to show my daughter that we don't live to serve only ourselves, and that we should use our talents to love and serve others. It would be almost impossible for me to continue working if I didn't believe this wholeheartedly, or if I had a job that I felt wasn't helping people in a real way. I hope she will not resent me for this decision, but instead will develop a sense of love and compassion for those less fortunate than we are. As far as I'm concerned, we're the three most fortunate people on the planet. Oh dear. I hear you. I also love my work and the people I serve and I cannot imagine not going back. But I also cannot imagine going back. Please share your tips when you have them. I just happened to drop in by chance,- what a beautiful baby! I totallly understand how you're feeling, it's so hard to leave that bubble you're in with a new baby. At 7 weeks she's so young! Fortunately in Norway we have a whole year of paid maternity leave(or parental leave, as mum and dad have to share the weeks between them) Good luck to you and your family!